The Court Stage fell under the jurisdiction of the Lord Chamberlain of the Household. A sort of super-butler in charge of everything “above stairs,” he was important enough to be guaranteed a seat on the Privy Council. Elizabeth’s first Lord Chamberlain, Lord Admiral William Howard of Effingham, an inheritance from her sister’s reign, was not only kept on but was given several lucrative posts by the grateful Queen: a close relative, he had been her staunchest protector on Mary’s Privy Council. Later, his oldest son, Charles Howard, would play an even more significant role at Elizabeth’s Court as Lord Admiral, Privy Councillor, and patron of the company that made Christopher Marlowe and Edward Alleyn superstars. It was the Lord Chamberlain’s job to decide what kind of entertainment to provide for each event, great and small, daily or for grand occasions, and to make sure that they went off smoothly. If properly used it could be a powerful political tool since it was the nearest equivalent to a Royal Public Relations office. Such may not have been to Howard’s taste, however, for from her coronation, Elizabeth had allowed her favorite, Lord John Dudley, to have charge of it. How much Dudley was actually involved with the entertainers, most of whom were also inherited from previous reigns, remains to be seen. He was probably much more involved with the military aspects of his duties as Master of the Horse. We can guage what kind of entertainments he favored while he was in charge by the bash he threw at Kennilworth in 1575 (the summer that Oxford was away in Italy)––lots of old-fashioned masking with skits where actors pretending to be spirits came out of the woods to sing or recite long dull poems to the Queen filled with lavish comparisons to goddesses along with the not so subtle suggestion that she ought to marry Leicester. Oxford’s earliest contributions to Court entertainment most likely consisted of musical numbers and interludes, brief comic turns that led one song or dance to the next for the various children’s companies to perform on holidays. These, the Children of the Windsor Chapel, the Children of the Queen’s Chapel, and Paul’s Boys, were the Queen’s favorite performers. Each little troop consisted of eight to twelve boys whose chief job during Catholic times had been to sing the Royal Mass, but who were also taught by their masters to dance and enact “dumb shows” (pantomimes) and comic “interludes” for special occasions. Both the London prep schools performed plays as well, sometimes for the Court. But Leicester’s (Dudley’s) control of the Court Stage was threatened when the Earl of Sussex took over as Lord Chamberlain. History ignores this, as it ignores most of Stage history, but we can be certain that Sussex was determined to return jurisdiction over the Court Stage to his office, that of Lord Chamberlain, where it belonged by long tradition. Leicester and Sussex had hated each other for years, and neither was going to let the other have any more power than he could help. As noted by McMillin and Maclean: “What happened to Leicester’s Men after 1574, when they would seem to have had the future in their hands, is one of the mysteries of theater history. Leicester’s Men lost their dominance at Court during the middle 1570s. . . .” (15). I hope to take a close look at some point at the probable scenario behind this mystery. In any case, to facilitate his effort to resume the office that was his by tradition, I believe that Sussex invited Oxford, well known to him from the 1569 war with the border earls, to expand his contributions to Court entertainment to include full scale plays and probably also concerts, dances, and poetry readings. As a result, 1573-79 was certainly Oxford’s heyday at Court. By 1579 he would have been writing for both the boys and for the adult actors who in five years would be heading the Queen’s Men. They were termed Leicester’s Men in the record books, but in reality at this early time they were simply the actors who provided most of the adult entertainment at Court. Literary historians have been limited by their adherence to the names of acting companies, derived from their patrons. To see the reality it’s necessary, whenever possible, to look past the names to the individual actors, particularly the lead actors, their patrons, and the always changing circumstances. The continual focus on the company names by historians has caused no end of confusion. History is made by individuals, not names. In 1581, shortly after the winter holiday season, the Queen banished Oxford from her “Presence” for getting her Maid of Honor pregnant and (not least) attempting to escape to Spain. This left no one to write the witty holiday plays that she had come to expect. The various children’s companies, some from local schools, filled in that December with old plays and material by their masters––Gurr calls it “the quiet season of 1581-82” (Companies 175)––but everyone involved in Court entertainment knew something had to be done to improve the situation before the next holiday season rolled around. Since that was about the time that Sussex began to fail, Walsingham, the Queen’s Principal Secretary, may have already have begun to consider a solution. 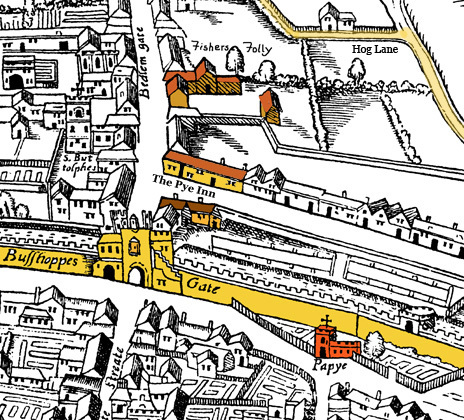 Walsingham was living at that time at The Papey, a manor just inside the Bishopsgate Wall and just around the corner from Fisher’s Folly on the other side of the City Wall. Plans to create a Crown company, the Queen’s Men, came to light early in 1583, but, like most things, they would have originated earlier, possibly from conversations between Oxford and Walsingham at The Papey, at Fisher’s Folly, or even at The Pye, the inn that lay between the two houses. This was the period when Walsingham was beginning to get special funding for the anti-papist campaign he and Burghley were urging on the Queen and Parliament. New funds would have enabled him to privide Oxford with money to hire secretaries and apprentices. This would explain why these writers, later known to literary history as “the University Wits,” dedicated their works to Francis Walsingham, calling him their Maecenas, a traditional term for a patron. From the Wits at the Folly Walsingham hoped would come plays both for the children’s companies to entertain the Queen, and for the Queen’s Men to take on the road as a public relations maneuver, winning hearts and minds in advance of the attack from Catholic Spain that he knew was coming (McMillin). With fears of the newborn commercial theaters rising among Church and City officials, with the excitement surging through the acting community from the power this was giving them, Walsingham may have feared that he was about to ride the whirlwind. A nervous man, in constant pain from an ulcer or other painful condition, his need to keep everything as hidden as possible has also hidden the courage with which, much like Churchill three centuries later, he faced one of England’s most crucial showdowns with Continental power. Why was it so hard to protect the newborn commercial stage? Why such need for secrecy? Read on. This entry was posted in Earl of Oxford, Early Modern literature, English Literature, Oxfordian theory, Queen Elizabeth, Shakespeare, Shakespeare Authorship, the Court Stage, the London Stage, theater history and tagged Earl of Oxford, Fisher's Folly, Francis Walsingham, History of English, Shakespeare, Shakespeare's style, theater history. Bookmark the permalink.